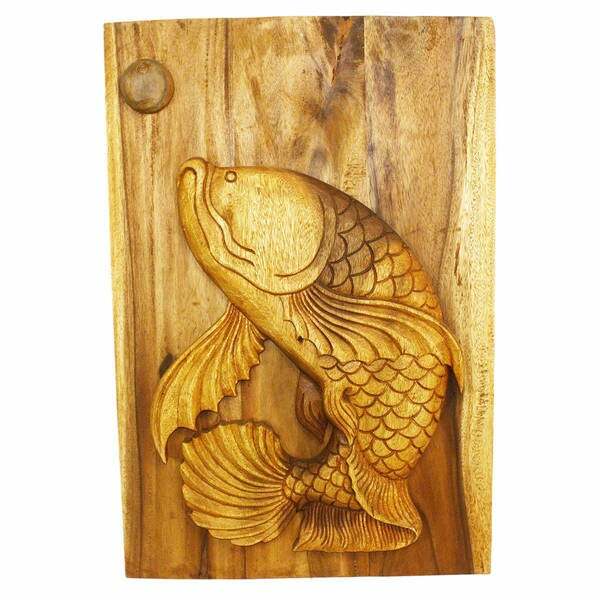 Bring natural, living beauty into your home decor with this hand-carved wall panel. A gorgeous three-dimensional carving depicts a leaping fish in this unique piece of art, handmade in Thailand. Carved out of joined panels of monkey pod wood, this wall hanging is hand-rubbed in natural, non-toxic golden oak-tone decking oil and finished with a protective layer of natural clear wax overlay. Each piece will have natural variations in color, texture, and form; this is not a flaw but adds to the beauty of each one-of-a-kind piece. Story Behind the Art:From Dusadee and Virod Prawkao in Thailand. Dusadee and her husband Virod have run this family carving business for 6 years. Virod is more of the artistic side, interpreting images for wood carving. He is mainly inspired by his Buddhist reflections to carve images in wood. To make most panels involves three separate panels that are joined on the back by bars. Then the image is traced onto the panel by hand. Carvers work while looking at the original on the wall to create the 3D image. After drying, the separate panels may bend or warp slightly. Products may have visible marks from tools used, patches from small repairs, knot holes, natural inclusions, or worm holes. There will be various separations or cracks on your piece when it arrives. These naturally occurred as the wood was dried and shrank. Over time, some continued shrinkage may accentuate existing separations or generate new ones. This does not compromise the structural performance or integrity of the wood and is considered inherent to the natural beauty of the design. Sizes are just an approximation but are generally within plus or minus a quarter inch. We cannot guarantee the products are perfectly square or flat. We do not fill in or repair carving marks, or natural inclusions like knots and branch growths. Instead we sand to blend them in and assure smooth edges and surfaces that are usable.